942k impressions with avg position of  ? Just describing it sounds complicated, and this formula is hard to implement, especially with large data sets. It would require looking up matching rows, then calculating the proportion or “weight”, then applying that to the avg position number, and finally adding them together. That is a lot of lookups and calculations, and it could be very slow. 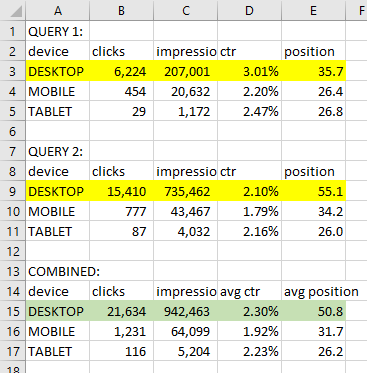 If you apply the same thinking to the click-through-rate (ctr) in a standard Google Search report, you will realize that you already have the clicks and impressions (they are default metrics) that are needed to calculate ctr (ctr = clicks/impressions). All you need to do is to append the data, combine the duplicate rows, then calculate the new ctr column from clicks/impressions. Note: if you can, include the base metrics in your query to eliminate the need for the second step. e.g. include Bounces and Sessions in your query instead of the Bounce Rate. While you could do all of this manually in Excel, this kind of step-by-step math is what the Analytics Edge Core Add-in is made for, and the whole process can be automated in a couple of minutes as this video shows. If you need to merge two or more sets of numbers and they include calculated metrics like averages, rates or percentages, make sure you combine them the right way. Don’t be put off by complicated formulas for weighted averages – the problem, and solution, is actually quite simple. Start with (or calculate) the base metrics, combine (sum) the duplicate rows, and recalculate the calculated measures. Simple operations for accurate reporting. This entry was posted in A. E. Core Add-in on 2018/12/05 by mike_sullivan.